This guide provides, under one cover, a wealth of practical information designed to facilitate the effectiveness of the GC/MS user. Separation conditions for numerous compound types are provided along with derivatized and underivatized compounds. A section on how to interpret mass spectral data, an extensive correlation of ion masses and neutral losses with possible structures, and examples of mass spectra are provided to further aid structure determination. 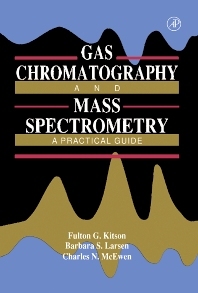 Also included are basic information on instrumentation, ionization methods, quantitation, tips on the operation of mass spectrometers, the best derivatization procedures for a variety of compound types, troubleshooting techniques, and a variety of other information found to be useful to the practicing user of GC/MS instrumentation. This guide would be immediately valuable to the novice as well as the experienced GC/MS user who may not have the breadth of experience covered in this book. Researchers, students, and technicians in biochemistry, biotechnology, protein science, and many areas of biological, biomedical, and medical research will be interested. Also interesting to an international audience for use as a handbook and text reference. Part I: The Fundamentals of GC/MS: What Is GC/MS. Mass Spectral Interpretation. Quantitation. Additional Literature Pertaining to Part I. Part II: GC Conditions, Derivatization, and Mass Spectral Interpretation of Specific Compound Types: Acids. Alcohols. Aldehydes. Amides. Amines. Amino Acids. Common Contaminants. Drugs and Metabolites. Esters. Ethers. Fluorinated Compounds. Gases. Glycols. Halogenated Compounds. Hydrocarbons. Isocyanates. Ketones. Nitriles. Nitroaromatics. Nitrogen-Containing Hetrocyclics. Nucleosides. Pesticides. Phenols. Phosphorus Compounds. Plasticizers. Prostaglandins. Solvents and Impurities. Steriods. Sugars. Sulfur Compounds. Additional Literature Pertaining to Part II. Part III: Ions for Determining Unknown Structures: M ± 1 to M ±200. Part IV: Appendices: Definitions of Terms Related to Gas Chromatography. Tips for Gas Chromatography. Derivatives Found Useful in GC/MS. Cross Index Chart for GC Phases. McReynolds' Constants. Simple GC Troubleshooting. Definitions of Terms Related to Mass Spectrometry. Tips and Troubleshooting for Mass Spectrometry. Atomic Masses and Isotope Abundances. Structurally Significant McLafferty Rearrangement Ions. Isotope Patterns for ClxBry. Mixtures for Determining Mass Spectral Resolution. Additional Literature Pertaining to Part IV. Index.